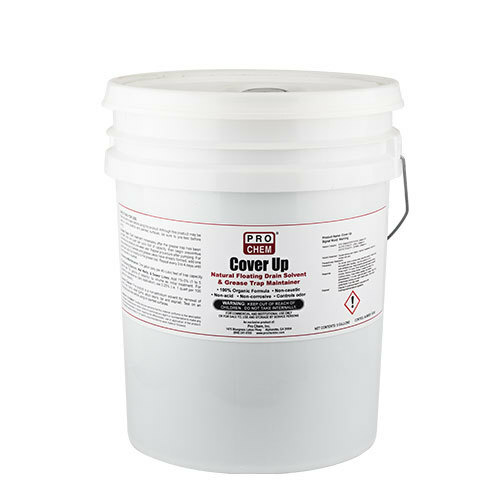 Cover Up | Pro Chem, Inc.
COVER UP is a biobased and biodegradable odor treatment for use in wastewater treatment plants. It coats the walls and surfaces in wastewater facilities, grease traps and lift stations to remove heavy grease accumulations quickly and safely. The special, nonemulsifying formula floats on the surface of the water creating an odor absorbing barrier while it continues to remove deposits as the water level changes. also, its pleasant cucumber fragrance helps mask to any escaped odors. LIFT STATION & WASTEWATER FACILITY: Use approximately ½ gallon for every square foot of wastewater surface area (1 quart for 100 gallons). Always maintain a protective layer of 1 to 3 inches of COVER UP above water level. GREASE TRAPS: Start treatment immediately after the grease trap has been pumped. Add 1 quart per cubic foot of capacity. After a week, begin preventive maintenance of one gallon daily per 40 cubic feet of trap capacity.